It ain’t much to look at (at least not this time of year), but Washington Park is the only public patch of green in LoNo. It’s much appreciated: when I’ve spent time there, it’s usually after grabbing fish sandwiches at The Corner Store with some coworkers and finding a tree under which to chow down. If I’m thinking ahead, I’ll bring a disc for us to throw around. Now that I’m about to live nearby, I figured it was time to find out more about it. The park is exceedingly simple, unadorned by sculptures or gardens, enclosed by a skirt of trees. It features concrete pathways (making it a popular place to walk dogs) and a few benches, but those things don’t leave much history to track. Looking at Zillow (whose estimates are shaky, I realize) median prices for homes bordering the park hover around $184,000 compared to $209,000 for all of 14850. 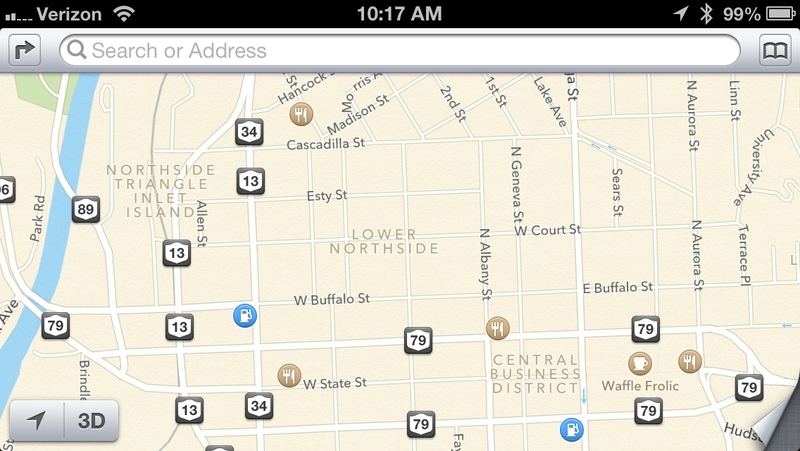 There’s nothing premium about this location, apparently. The blocks around Washington Park, laid out in 1832 by Simeon DeWitt and his son Richard Varick DeWitt, were built up with homes by the end of the century. 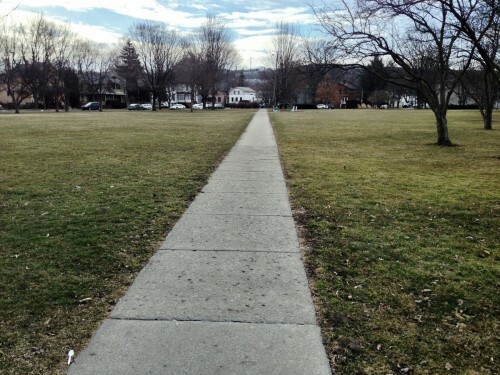 The park has been under municipal authority since 1847 and is still an important open green space enjoyed by all Ithacans, especially those in the immediate neighborhood. The Nathan T. Williams administration, in 1847 and 1848, proceeded to make up for lost time in public improvements. Owego Street was planked from curb to curb, from Aurora Street to the Inlet. Other streets were opened, extended, or improved. Washington Park was taken over by the trustees for control, improvement, and public use. Since the establishment of the board of public works, the local park system has been much improved. 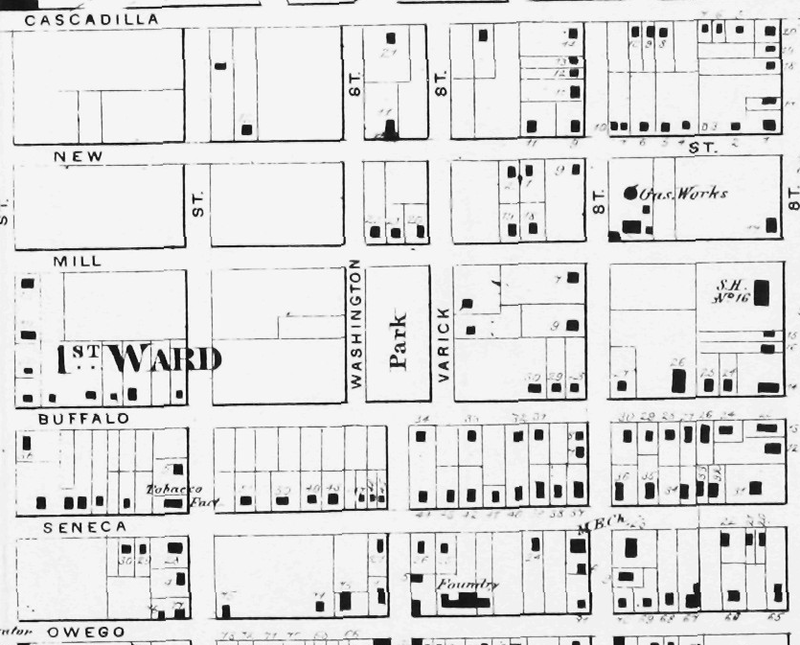 Washington Park, bounded by Park Place, Buffalo, Washington and Court Streets, was filled in and developed in 1908. Ithaca has several very useful and delightful smaller parks. Washington Park on Buffalo Street and Park Place serves many westside children during summer months. This park formerly provided a practice field for the High-School Marching Band before it moved to its new home on North Cayuga Street. In my experience the park area is relatively quiet, so it’s hard to imagine a marching band blasting its music in the middle of a dense neighborhood. 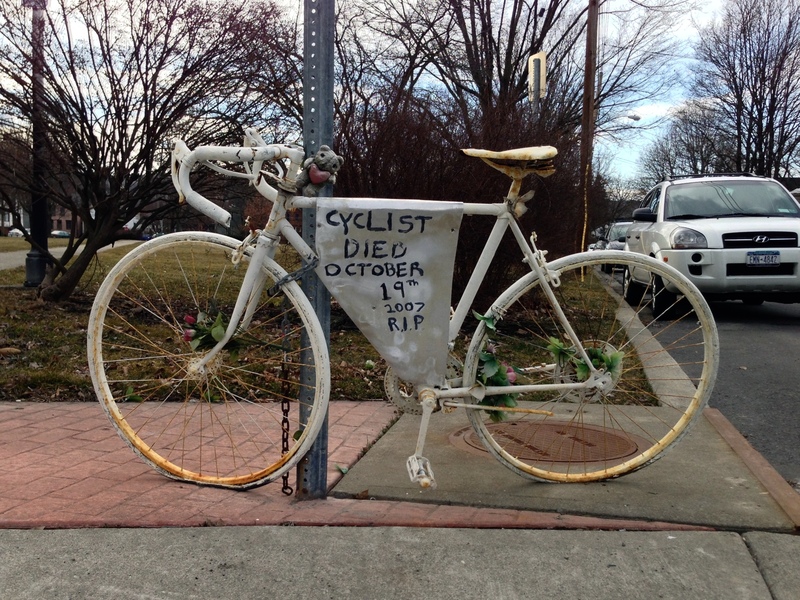 Anyone who has walked by the park has noticed a bit of more recent history: a ghost bike (a bicycle painted white as a memorial to a fallen cyclist and a reminder to drive with care) chained to a stop sign at the corner of Court and Washington Streets. The bike honors Edward Coil, a 58-year old rider of an adult tricycle killed by a FedEx truck in 2007. I’m one of those jerks who prioritizes aesthetics over a lot of things (and this bike could use a new coat of paint, to be honest), but it’s a mournful reminder to respect cyclists in this bicycle-heavy town. Washington Park lives in the shadow of its downtown rival DeWitt Park and it doesn’t feature all the recreation that Stewart and Cass parks offer. But Washington was established well before those latter two parks and has been a fundamental part of the city’s design since the beginning. We’re lucky to be in this part of the city, where residents can choose from Washington, Conway, Thompson, and DeWitt to bask in that rare sunshine. It isn’t fancy, but it’s an easily accessible, decent-sized oasis. There’s potential for greater excitement too: while Thompson Park appears to be the front-runner for a food truck roundup, Washington Park is being considered too (personally I’d like to see a rotation among all the parks). Those visits from the office would get even better.